Five-time world champion Ronnie O'Sullivan was dumped out of the 2018 World Championship by Ali Carter amid some controversial scenes. The world no. 2 resumed at 9-7 down and could not claw Carter back at The Crucible as he eventually lost 13-9, following world number one Mark Selby out of the competition. Things got ugly, briefly, when the two men made physical contact in the 19th frame. 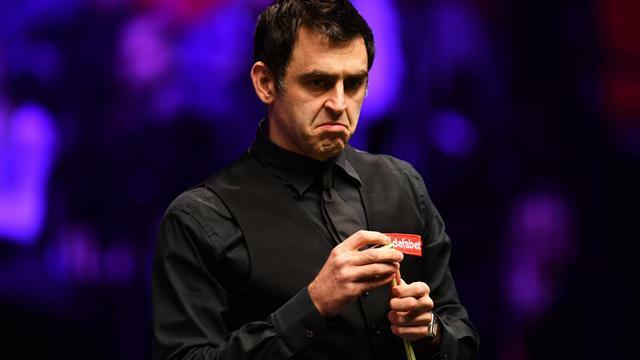 O'Sullivan claimed the first frame of the session with a masterful break of 52 from a tricky position, developing a series of difficult reds against the cushion. But in an engrossing contest, Carter accelerated away again when he compiled a break of 63 to go 10-8 in front and then added the next frame too. In that 19th frame, which Carter won 58-29, there was an extraordinary moment when the two men bumped shoulders walking past each other in what seemed a deliberate gesture. Words were exchanged between O'Sullivan and Carter and the former looked to be fuming as he took his seat. According to reports, O'Sullivan said to Carter: "You're Mr Angry... stop being angry." When O'Sullivan then told Carter it was his turn to take a shot, Carter replied: "Thank you very much, very nice of you." To which O'Sullivan responded: "Stop being angry then." Referee Paul Collier had to step in to appeal for calm. O'Sullivan then claimed he was "cool as a cucumber". Perhaps it spurred the five-time champion on, as he racked up 130 points with no reply from Carter, spread across two breaks of 71 and 59, to head into the mid-session interval 11-9 down. O'Sullivan was at the table again after the resumption but missed the easiest of blues into the middle pocket to allow Carter to clean up and get within a frame of victory. In a scrappy final frame, Carter wrapped up his first ever career victory over O'Sullivan. Trailing 5-3 after the first session O'Sullivan looked hopelessly out of sorts during the opening frames. Carter took advantage with some fantastic long potting and a break of 72 capped a terrific start that saw him win the opening three frames. O'Sullivan kicked into life just before the interval as a break of 55 saw him draw one back before another 55 after the mid-session pause made it 8-5. One of a number of unfortunate kicks for O'Sullivan allowed Carter to get in during the 14th frame and he won out despite both players making half-centuries as the score went to 9-5. But O'Sullivan responded in perfect style as first a 79, then a 105 saw him close the gap to 9-7 overnight in the best-of-25 match. Ali Carter made a strong start against five-times champion Ronnie O’Sullivan in the World Championship second round, establishing a 5-3 lead in their best-of-25 frame encounter at the Crucible. The two-times former finalist won a scrappy opening frame after an unusual error by O'Sullivan – who rolled the cue ball into the pocket after sinking a long red – as he took the opening frame. O’Sullivan - who defeated his fellow Englishman in the 2008 and 2012 world finals in Sheffield - responded with two quickfire frames, including a 121 break before Carter hit back to restore parity at the mid-session interval. It was a clearly focused Carter who was the dominant force for the remainder of the session as world number two O'Sullivan threw in a few sloppy shots to hand his opponent the initiative despite producing 96 in the sixth frame. The 15th seeded Carter snared three out of four frames to assert himself with a two-frame advantage that included superb breaks of 115 and 68 before their second session of another eight frames at 7pm this evening. They are due to play to a finish at 2:30pm on Saturday morning with the first man to 13 frames claiming a quarter-final place. In Friday morning's other second-round match, Joe Perry produced some fine snooker to level his match with Masters champion Mark Allen at 8-8 having trailed 5-3 from Thursday's opening session. They finish off their meeting on Friday night at 7pm with the winner being the first man to reach this year's last eight.